We hope you enjoy our feature this week with Kacey Harmon of GLFR! Kacey – we appreciate your time today. Let’s start with some background… Where are you from? How’d you get started? a half north of Salt Lake City. My first job when I turned 16 was working at Birch Creek Golf Course. I loved working there… I was in charge of the driving range picker, and I was the cart boy. I was in heaven every day working at that course. Usually, I’d work my 8-hour shift, then play until the sun went down. Working at the course, I saw a lot of businessmen playing and living a lifestyle that I could see myself living. A lot of these guys owned their own businesses or worked some corporate job with the freedom to come and go from the office as they pleased. I later attended Utah State University and graduated with a degree from the Jon M. Huntsman School of Business. I studied Management Information Systems. After graduating, I took a corporate job doing data analytics and business intelligence. Since then, I’ve started GLFR and partnered with a couple of people who are integral to the success of GLFR: Zach Baldwin and Brian Freeman. That’s great, Kacey. Thanks for the background. Let’s turn the clock back a bit… when did you really start playing? And why did you pick it up? I started playing golf when I was around ten years old at a little nine-hole golf course that didn’t have any par 5s. It was the cheapest place to play near my house and the only place my mom could afford after my dad passed away. Since playing an actual round was pretty expensive, I spent most of my time chipping and putting. I loved golf – it was me versus the course. I’ve never been the biggest. Not the fastest or strongest kid. So I struggled to compete in basketball or football even though I liked those sports. Golf was just where I could compete and win. Yup, it’s that individual aspect that draws a lot of people to the game. I’m really sorry to hear about your dad. We’ll circle back to that subject in a bit if you don’t mind. I’m curious what made you want to start GLFR? Sure – well, one day I was driving to work and thinking, like many people do, about how they wish they could do something for work that they loved. I didn’t dislike my job, but I also didn’t wake up every day excited to be there. I remembered the saying: “If you do something you love, then you will never work a day in your life.” At this time, I wasn’t playing golf as much as I would’ve liked, but I was enjoying the health and fitness aspect of my life. I thought back to the days when Tiger dominated the Tour. I’d reminisce his fist pump in his Sunday red… It was apparent he had a physical advantage over the field. In my life, I feel he was the first person to really step to the tee and make you think: “That’s an athlete, right there.” I thought about today and how a lot of the best golfers in the world now have followed Tiger’s example and implemented health and fitness into their routine. I went home that night and watched every YouTube video I could that would show professional golfers and their take on fitness. To my surprise, fitness was essentially becoming the norm for competitive golfers. Every-day guys with a great swing faded fast on Tour. This is when I thought I needed to find something to bring my two passions together: Golf and Fitness. I knew there were several gyms already established for golfers to train, so I wanted to do something different – something unique. That’s when I came up with the idea to develop and design health and fitness supplements for golfers. All the protein powders, pre-workouts, BCAAs, etc. that I was buying were designed for bodybuilders. Usually, they had a picture of some jacked dude on them telling me I could look like them… That wasn’t my actual goal when I was going to the gym, right? Sure I try to improve my physique and exercise for the purpose of aesthetics, but it was mostly for functional fitness that allows me to do the activities I love doing. Being fit allowed me to golf more, hike and hunt more, be healthy for my family and be more productive at work. There were times when we were pretty discouraged wondering if this was a waste of time and money. People who don’t golf would always hear what we were trying to do and would say we’re destined to fail. 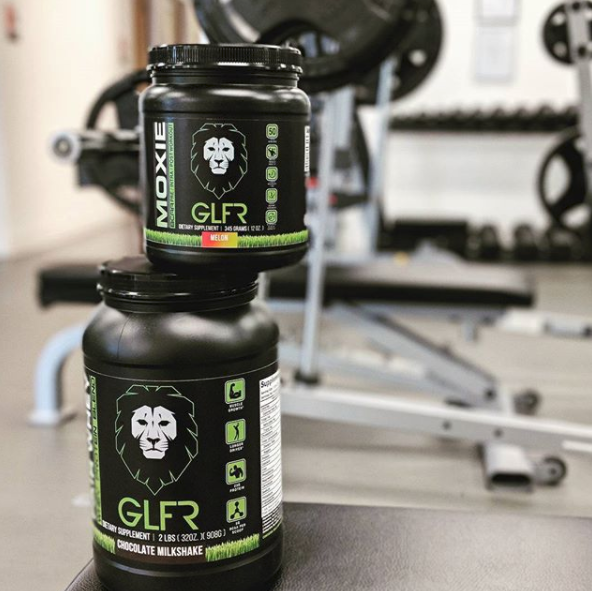 “Golfers don’t work out” or “Golfers don’t need supplements.” In fact, there are probably several people reading this now that think the same thing. I can almost promise that those people have never considered the benefits health and fitness play in their game. In early 2017 it was coming together. We finally found a manufacturer that we could work with us that met our needs. After countless hours and meetings, we were ready to launch. 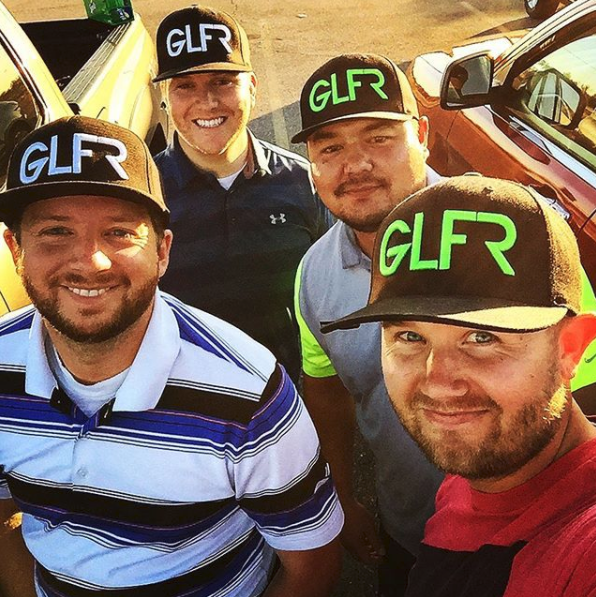 On Masters Sunday 2017, we launched GLFR, and it has been a whirlwind in this first year of business. We are continuing to improve our process and products every day. It always seems to be a process… You mentioned picking a name. How did you arrive at GLFR? I guess I’ll have to talk to Ryan about our name… So you mentioned that you had dabbled in a few other entrepreneurial ventures prior to GLFR. Would you mind expanding on that? I’ve always had that entrepreneurial mindset. As a young kid, my mom would pay me $10 to mow the lawn each week. After I was done mowing the lawn and received my $10 payment, I’d have her drive me to the local supermarket where I would buy four different 12 packs of soda and a bag of ice. Then I’d sit on the corner near my house and sell the cans of soda for 50 cents apiece. I didn’t know I was being entrepreneurial at the time, but this approach staged the rest of my life. I have since started or owned several other small businesses. Some have succeeded, and some have failed… hard. Other entrepreneurial ventures include starting a Christmas light hanging service called Night Lite Lighting, and a car detail and a car sales lot called Kleen Freek Car. With my current business partners, we previously sold products online such as sunglasses and hunting backpacks and accessories. Currently, we’re fully devoted to GLFR and growing the company. If at first, you don’t succeed… that’s awesome you have that entrepreneurial drive. So, what doors have opened for you and your partners since starting GLFR? Nothing like Augusta on a Sunday… What have you learned most from starting GLFR? I have learned that nothing will ever be perfect before you start something. There will always be something that you wish you had more time to work on. 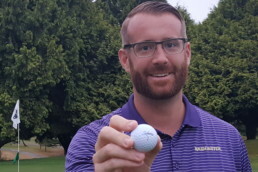 It could be starting your own business, or it could be getting ready for a golf tournament. Sometimes you just need to start and figure things out as you go. If you try and wait until everything is perfect, you’ll never launch your business. Such great advice. Inaction kills. So, how does GLFR engage with the community? Mostly through social media. Social media is such a powerful tool to be able to reach people all over the world and talk directly with them. We love receiving messages on Instagram or Facebook with people asking questions about the products or for tips on how to improve their game. Is there anything else you’d like your audience to know? You’re in good company. I’m going to hit you with some rapid-fire questions now if that’s okay. Who or what is your greatest inspiration? Autonomy. Autonomy is my greatest inspiration. The ability to do what I want is so valuable to me. That is why I love golf. It is up to me to decide what to do or not to do. That is why entrepreneurship is so fun because I am in charge of my success and can determine what the next step is rather than having someone else tell me what to do. Absolutely – what’s your favorite time of year to play? Time of day? I love hot summer days. I’ve tried to get my wife to move to Phoenix so many times. I love a warm summer afternoon when there is a slight breeze to take the edge off, but it’s in the mid-90s! Well… I never got to play golf with my dad. He passed away from Lung Cancer when I was ten years old. I can remember riding in the cart with him and his friends on Saturday mornings when he would go out and play, but I never actually played a round with him. After he passed away, I began playing but never had that opportunity to hit the sticks with him. I would play with my dad, Kip Harmon. I’m sure he’d be happy to know you picked up the game after he introduced you to it. Change of pace – what’s your favorite course beverage? Mountain Dew… I know it’s a terrible drink and does nothing for hydration. But damn – it’s delicious. Can’t knock it. Besides GLFR products, what golf-related or business-related purchase have you made in the past year that you are most excited about? Just last year I purchased a set of Taylormade M2 Tour Irons that I’ve been loving. I won them on Ebay by “accident.” I saw an auction going on for that set, and I knew I wanted them. The price was really low, and there was around 6 hours left. I placed a bid for fun, fully thinking I would be outbid multiple times. Well… six hours passed and nobody else placed bid. A few days later I had a new set of irons! I like them a lot. Oh, and for my birthday last year, my wife bought me a Scotty Cameron. I had a Scotty all growing up and loved it. In a weak moment a few years ago, I sold it for an Odyssey putter. The Odyssey is fine, but it wasn’t my beloved Scotty. My wife was kind enough to make my putting dreams come true and got me the Scotty Go Lo 3 that I wanted. I don’t think I have 3-putted since! It’s always best to blame the putter. So as an entrepreneur, what tools do you use to get focused or maintain focus? How do you structure the first hour or two of your day? Do you have a typical morning routine? Evening routine? exercising. After the gym, we will come home and make dinner. Usually, she will make the dinner, and I will open the laptop and either finish up any work items outstanding. Or I’ll surf the web and check on things like sports scores, investments, or YouTube. We will often turn the TV on to have something on in the background. Generally, this routine helps to wind down and get away from thinking about work. Do you recommend any resources to an aspiring entrepreneur? Books, magazines, blogs, etc.? I recommend a place to write down your thoughts. I use the notes section on my phone. Whenever I have a new idea or a way to improve something, I open my notes and write it down. I recommend writing as much detail as possible. At the time you are writing it, you will think all you need to write is one or two words, and you will remember everything. But that’s not usually the case. When your brain is thinking and inventing like that, take advantage and write it down. This helps tremendously in staying on top of all of your thoughts. Recently, I’ve gotten into books. I use Audible to listen to them. I struggle to sit down and read, so listening is a great alternative. Awesome. Thanks a lot spending the time with us today.